Metabolic rates in the strepsirrhines are significantly lower than those predicted by the Kleiber scaling relationship, averaging 38.6 ± 4.7% below the norm (Table 1). The range of predicted values for strepsirrhines is from -1.52 to -69.22% below those predicted by the Kleiber scaling relationship, and 14 of the 17 strepsirrhine species are hypometabolic by criteria described above (i.e., >20% below predicted by Kleiber scaling relationship). Euoticus elegan-tulus, Galago moholi, and Galago senegalensis are the three strepsirrhine species not classified as hypometabolic, with metabolic deviations from those predicted by Kleiber scaling relationship of -1.52, -19.62, and -18.11%, respectively. Within strepsirrhines, lorisiforms (lorises, pottos, and bushbabies) (n = 10) have RMRs that average 30.5% below predicted, while the lemuriforms (Malagasy lemurs) (n =7) average 50.1% below predicted. Bushbabies (Galagonidae) (n = 6) are slightly hypometabolic averaging 20.9% below predicted. 3 There has been debate in the anthropological literature in recent years regarding the most appropriate line fitting technique for describing allometric equations; some favor the use of ordinary least squares regressions (OLS), some the major axis (MA), and others the reduced major axis (RMA). OLS may underestimate the true slope (when the coefficient of determination [r2] is low) because it does not consider error in the X variable (Harvey and Pagel, 1991). However, the preferable method for accurate and effective controls (especially with high r2 values) for the effects of body mass is OLS (Harvey and Pagel, 1991), which we use in this study. Figure 1. Log10 plot of RMR (kcal/day) versus body mass (kg) for strepsir-rhine species (n = 17) and haplorhine species (n = 24). The strepsirrhine regression has a significantly lower scaling coefficient than predicted by the Kleiber equation (RMR=70M0 75). in strepsirrhines than haplorhines (P <0.001). The strepsirrhine regression substantially deviates from the Kleiber scaling relationship. 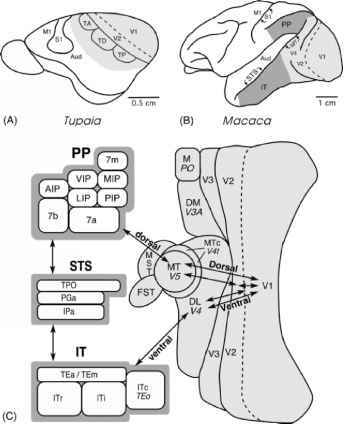 The scaling relationship in the strepsirrhines is: RMR=36.3M0 56, whereas in haplorhines the relationship is: RMR= 66.4M0 80; the latter is almost identical to the Kleiber scaling relationship prediction (i.e., RMR = 70M0 75). Haplorhines average 1.9 ± 3.8% above predicted values and do not significantly differ from Kleiber scaling relationship predictions. 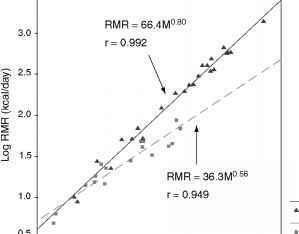 The relationship between body mass and RMR for the combined sample of primates (n = 41) is RMR= 54.7M081.